Our friends just posted this on facebook this morning. Apparently a company called Dynamic Pet Products are selling bones that have been killing dogs by splintering and ripping into the intestines causing blockage. This has been going on since 2007. You can read the horror stories here on Consumer Affairs. Please spread the word, and most importantly, never feed your pup this product. Here's to hoping Jack dog will pull through alright. 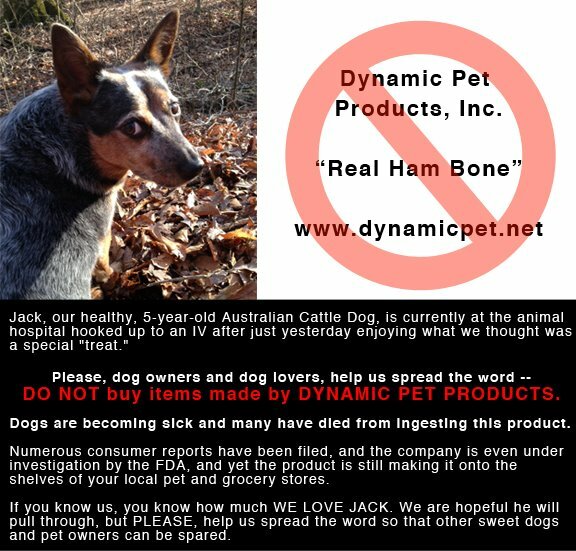 Yesterday Abby and I gave Jack (our Dog) a bone made by Dynamic Pets called a Real Ham Bone. Jack has eaten many real bones before and he's never had any type of problem with them. About 5 - 6 hours after giving him the bone he got really sick. He was obviously uncomfortable and appeared to be very gaggy. Jack is kind of a gaggy dog as those of you that know him well know. Jack had to go out several times last night. This has happened before so I didn't think anything of it. At 5:30 am Abby and I got up to go running. Jack wasn't in the house and he wasn't answering when we called him outside. Abby and I live in a remote wooded area and Jack has never run away before so we just let him out when he needs to use the bathroom. We spent 1.5 hours looking for him. Finally, Abby decided to drive down the road looking for him in the car. Abby found him about a half mile from our house on the side of the road. He had dug a hole under some brush and was sitting there looking horrible. We called the vet to see if there was anything we could do to help him from home. Anyway, long-story-short, we ended up taking him to the vet. He has a blockage in his intestinal track and he needed to stay at the vet for the day on an I.V. The doctor sounds optimistic that he's going to pull through. As this was happening this morning Abby and I read several reports of other people's dogs dieing from ingesting Dynamic Pets Real Ham Bones. I have included a link below to just a few consumer reports as well as a website devoted to getting these bastards shut down. Please don't feed your dog any products from this company and please re-post this to spread the word about this product. The FDA said pet owners can report any health problems their dogs experience with Dynamic Pet Products chew bones or treats to the agencys Consumer Complaint Coordinator in their region. So please tweet, email, fb share, contact the FDA, and do something to help stop this! I am one of the many people who's dog almost died. I was one of the lucky ones. Google Dynamic Pet Products and you will not believe that these are still on the shelf. I am working on suing them as I speak. People need to contact the media, consumer affairs, better business bureau, FDA, USDA. We should take care of dogs! Add me to your class action suit - my dog came close to death last week from eating one of these bones - WHY ISN'T THIS STUFF TAKEN OFF THE MARKET?????? The company is still selling these dog killing treats. Over 100,000 shares in 24 hours. One of these bones killed our dog this week, March 23, 2015. Your Better Business Bureau is working to protect your pets. If you or someone you know has had a dog become ill or die after being given a Real Ham Bone distributed by Dynamic Pet Products, BBB would like to speak with you. Email us at complaints@stlouisbbb.org or call us at 314-584-6723.